A traditional Japanese breakfast often includes rice as part of the meal. 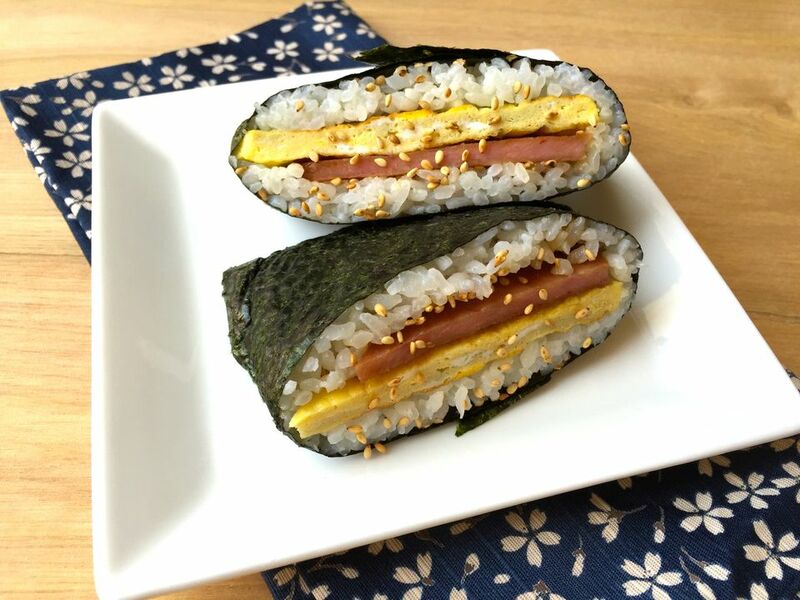 As such, a Spam and egg breakfast onigirazu might just be the solution for a busy morning, because it is a quick breakfast to take on the go. This recipe assumes that cooked, steamed rice is already available. If not, cook 1 cup of uncooked rice to yield 3 cups cooked rice. Crack egg and scramble in a bowl. In a small non-stick fry pan, heat canola oil over high heat and add egg. Fold over to make a small squarish omelet. Set omelet aside. In a small non-stick fry pan, cook Spam slice until golden brown. On a dry cutting board, lay a large piece of plastic wrap down. Place dried seaweed down on top of the plastic wrap, place about 1/3 cup cooked rice in the center of the rice in a diamond shape. Sprinkle roasted white sesame seeds over the rice. Lay the egg omelet and SPAM on top of the rice, then add a top layer of cooked rice, just enough to cover the onigirazu fillings. Close the onigirazu by folding in the ends of the dried seaweed to form a flat, square rice ball. Slice the onigirazu in half with the plastic wrap still on, which makes it easier to handle. Or, don't slice it at all and take it with you on the go! The recipe featured in this article is to make one (1) onigirazu. One 12-ounce can of Spam yields approximately 8 to 10 slices of Spam, in the event you are interested in making onigirazu for a large number of people.